Good point. MAS, it would seem, could recover all costs although there may well be some exclusions in the policy which we do not have to look at. At the end of the day, you can be sure that if you “total” your wife’s BMW 7 Series, that your rates will go up substantially in the future. Insurance companies are not in business to lose money. It is not a sustainable business if that were the case. Likewise you can be sure that “on average” insured parties pay out more than they receive from insurance companies. That is why it makes sense to be self-insured if you can afford it. Many companies chose that option relative to insurance on rental vehicles etc. Going back to your Dropbox post,, one of the reasons I linked that addy was because of the diagram you showed besides the photos within. Interesting if you compare that data set with the one simulated by Boeing for 370 as posted by @david earlier at 11.16pm above. Phugoid prominent in there as well the only difference being a. The simulation was stopped at FL10 b. the constraint that it was done with certain limits imposed. I associate this with Peter Foley’s comment on the NZ Radio interview that Brian Anderson posted, that Boeing had continued simulations in 2015 and this year of aircraft behaviour after fuel exhaustion, leading to BFO no longer being the main course. Either the ATSB was wrong with their dive theory or the DSTG was wrong with their Bayesian theory. As MAS had a good safety record until MH370 we can assume, that their insurance premium was average. The decision for self insurance comes into play, when the premium rises considerably, like you rightly expect after two hull losses in short time. For the calculation of the premium the overall financial risk + cost + planned revenue is devided by the handed policies. On top goes the individual risk of an individual customer with greater risk than the average one like after 2 accidents. Therefore the MH370 case is burdened on all customers with an individual aditional premium rise on top for MAS. @Gysbreght. If it’s not there it is somewhere else. Why? 3. The 7th arc is in the wrong place because the ISAT BTO interpretation is flawed. Why is it that everybody seems to believe (3) is out of the question? After all, it took several iterations before BFO interpretation was considered “right” and even the experts revised their interpretation (ref revision of BFO table in ATSB report). What if it is not about flawed Bayesian or dive theory? What if it is about improper equipment and inadequate experience in deep sea search dynamics that have thwarted location of the fuselage. I distinctly recall some quarters questioning Fugro’s selection for the job when another well equipped outfit plus well experienced at that from AF447, was not considered. Perhaps ATSB’s incompetence in that area is coming home to roost at last. Just as what i had suspected and little wonder as to why they went along with ATSB given their past experiences with Boeing Asiana Korea 991 and the Dubai UPS Boeing crash. The former’s crash data set has eerily similar features to that generated by the sim runs of Boeing (per your drop box at 11.16pm above), only difference being the sim run was terminated st FL 10 while Boeing Asiana tragically continued tumbling down from that height. The 7th arc has nothing to do with the BFO. It’s determined solely by the BTO which unlike the BFO is a very simple calculation and hasn’t changed since the first few hours. I missed that dropbox-link from @David somehow. Interesting indeed. Also interesting is that picture of the Pemba-piece outboard flap section. It shows with the hinge removed and two inspection doors removed too. Is this picture a ATSB picture? -no complete certainty about what triggered the 0:19 log-on. Similar to the yet unexplained 18:25 log-on. If the 0:19 log-on was somehow triggered by the left engine flame out at the 7th arc the plane could have flown on for another ~15min beyond the 7th arc on the remaining right engine fuel. Perhaps both IDG’s where isolated at IGARI flying on back-up generator only and at 18:25 only the left IDG was brought back on line again? Resulting in an APU start at 0:19 triggering the log-on sequence for the right IDG was still isolated. And then the IFE did not respond in the sequence because power was switched off to it. Haven’t found or heard explanations yet this would be impossible. Or the APU, feeding on the empthy left main tank, stopped before the log-on sequence could be finished including the IFE log-on. If I may add some of my thoughts on the insurance part. I don’t think one-to-one damage repair fully covers an airline in cases like these. On the one hand, a leading insurer’s will to cover loss of hull within 72 hours (or so) is not only evidence of the airline’s strength in relation to NoK, who may have to wait for decades for reparation. It is also a clear indication of small margins and great risk for employees, and suits from future passengers/customers who won’t be delivered to their destinations. So it is definitely in the insurer’s interest. Also, it is not unlikely that reparation to the carrier to some extent is meant to work in such a way as to make cover-ups less of an interesting or workable option, since it benefits communications, the industry and mankind in the long run. On the other hand, if reparation from the insurer actually could cover all aspects of all the losses in full, then the companies stock on the stockmarket would not have moved a dime from the accident/s, and that was not exactly the case. Some of this will be market actors trying to follow the flow of the tide, but the devalution that remains is loss of goodwill, i.e. brand value, trust, hopes, (self-)respect and the like. And the market value of the stock will affect the actions and beliefs of the big fish that are the shareholders, who may sell off and take their money elsewhere / a competitor. And this will affect the company’s capacity to make good deals, cut costs with banks, take loans, attract the best employees, hold down salaries and be on the receiving end of development initiatives and innovations etc. There could be others and even more significant effects. So the question whether MAS would have a reason to keep to themselves what really happened is not straightforward. On the one hand it is not likely to pay off much in the greater scheme of things. On the other it may be a spine reaction and a functional working principle from the people involved who want to protect their company, its owners and its employees. Most cover-ups of anything “substantial” seems in the light of the above, to be difficult in the long run, as secrets will be hard to keep in an environment of really big money. The truth is, I just don’t know without looking at the details of the policy. i have never seen a one page policy that says we will insure against everything no matter what happens. Certainly my own policies have a number of exclusions relative to both the particular insured items and the circumstances of the losses. You could be right, but I would be very surprised if the policy was an open ended guarantee of coverage. @Gysbreght: Contrary to your claims, the coordinate transformation that I describe is not arbitrary, it was not invented by me, nor am I a magician. This transformation and others like it are described in many text books. With a simple Google search you can find many references if you bothered to look. Notice that the stability coordinate system, in which the reference axis coincides with the flight path under zero slip conditions (Section 13.3.5), is used to develop the equations of motion in Section 13.6. I know we will not reach agreement (you and Oleksandr still haven’t come to an agreement on slip/crosswind) and you have a headache, so I won’t continue this discussion. I have showed you how to do the transformation with specific values of the wind field and I have presented references for more generalized cases as well as the logic for this coordinate system. It is pointless to continue since I have already presented all the information for anybody interested. We will not reach agreement because you are wrong (just as Oleksandr was. He was also very stubborn). First let me thank you for a very useful document. I have read it with interest. My headache has lifted and I cannot let you get away with what is either a dumb misunderstanding of that document or a cunning game of deception. Knowing that you are quite clever I suspect the latter. The USAF TPS Manual, 13.3.4 describes the Body-Fixed coordinate system. That is the BodyAxis coordinate system. It then describes in 12.13.5 the stability coordinate system. That is the BodyAxis system rotated through a single rotation about the lateral (y) axis by the angle of attack, alpha. In a note it says that under zero sideslip conditions the x-axis is aligned with the flight path vector relative to the surrounding airmass. Section 13.6 develops the equations of motion, i.e. the relations between forces and accelerations. It is not particularly relevant for the interpretation of (XYZ)VelBodyAxis which are speeds. The most insidious magician’s trick you are performing is to suggest that (XYZ)VelBodyAxis are components of (XYZ)World, the speed of the airplane relative to the local earth surface, in the presence of horizontal and vertical speeds of the airmass relative to ground, rather than components of the true airspeed TAS. The circle of deception is closed with the final waving of the magic wand, that Pitch should not be interpreted as pitch attitude, but as flight path angle. The USAF TPS Performance Flight Testing Manual is recommended reading. @DrD. I am aware of the difference between BTO and BFO. a) That the “expert” (ie official, within investigation) interpretation of BFO changed, c.f. amendments to relevant table in ATSB published report. This tells me that although the system was logging BFO, it took the SWG expert group a while (with the help of some external [read IG] scrutiny) to get it right. b) That the independent satcom experts also had a long and tortuous back-and-forth before they thought they had taken account of all parameters to understand what BFO “meant”, cf TMF discussion that ran to >900 comments. This among folks (or at least the knowledgeable commentators) who do satcoms for a living or at least have an advance knowledge of the field. With a BFO “truth” as shifty as that, are we even 100% sure that the eventual consensus was indeed correct? With regard to BTO, the classical interpretation (round trip propagation time + constant) has been regarded as sacrosanct and physically deterministic. I have no doubt at all that the “math” is correct. My question is whether we can really be 100% sure that the BTO interpretation is correct? After all, the “first stab” by the experts – including those who built/owned/operated the system – was not correct wrt BFO. Is “offset”not a closed loop control value designed to enable remote stations to get their synchronisation right on the TDMA transmissions? Unless you have access to the specific algorithms in use for this particular manifestation (LES, satellite and AES), how can you be sure exactly what BTO is measuring and how the system is using it? Relative to self-insurance it is simply a recognition that no matter what an insurance company charges you they are making a profit on the premiums (statistically). In my own case I am self-insured for property damage to my own property as well as someone else’s property involved in a loss relative to my actions. I do carry a large liability policy with a big umbrella on top of that. Liability claims can be almost unbounded. My reasoning is that I am wealthy enough to act as my own insurance company, and stick the premium for property damage in my pocket. Writing a check for “wadding up” a $50000 BMW would not be a pleasant experience, but it would not have a material impact on my lifestyle (thank you Silicon Valley and stock options). @Gysbreght: As I have said, in this coordinate system, ZVelBodyAxis is the TAS (along the flight path wrt air). XVelBodyAxis and YVelBodyAxis are the wind components along orthogonal axes. I have provided the specific values of crosswind, tailwind, and updraft to make the transformation back to the World coordinate system. Do it yourself. It all fits. As for why FSX chooses to confuse FPA and Pitch, I don’t know. But that’s what the math seems to indicate. Your proposal that the simulator was “broken” because you don’t agree with the transformation between the two coordinate systems is highly unlikely. As I said, I am done arguing. I provided the specific values of wind field to go between the two coordinate systems if anybody else cares to check my work. I’ll ignore your inane accusations about my intended deception, but it is an indication of your mindset. I have not even looked at the nuances relative to the sim data. To me its value lies in its “existence”. Certainly checking the values is a good thing, and I am happy that people are looking at that just from a data integrity standpoint. Although I am not paranoid enough to believe that it was synthesized as part of some broader deception. @VictorI: You are mistaken. If ZVelBodyAxis is the TAS (along the flight path wrt air), then XVelBodyAxis and YVelBodyAxis are zero. I hope this is not going to end up the way it went with @Oleksandr. I guess it’s sometimes called the ‘peanut gallery’ because of this kind of argumenting. With all respect to both of you wizards offcourse..
Criminal intent is always excluded, gross neglicence sometimes. I think most people see the possible behaviour of one if the pilots as reason to void the insurance policy for the above reasons. Imho this is a misinterpretation, as the misbehaviour of one of the employed folks, even a criminal one, is a high risk for a company. The exlusion terms normally are restricted to the top brass of the company, which could profit from such criminal intent. I’m not sure wether the self insurance is a plus for the shareholders, as they would loose the money at the end of the day in case of some big uninsured loss. The insurance payment is a calculable risk with minimal influence on the shares of a company. I’m sure it feels good to be in a position where insurance is more nuisance than benefit, but be aware that the percentage of people who are in this position is probably less than 5%. So feel lucky to be one of those! That is absurd. FSX doesn’t confuse FPA and Pitch, you do. Pitch is pitch and BodyAxis is body axis. It all fits if you do your math correctly. @Ge Rijn: As I said, I am done arguing. Anybody that cares enough to dive into the details (and I doubt many will) have enough information to make their own decision about whether the simulator was “broken” and whether I am participating in mathematical deception. @DennisW: As you have noted, one of the unfortunate aspects of the investigation of the disappearance of MH370 is that it seems to bring out a maniacal paranoia in some. When that surfaces, it is not possible to rationally address, so I don’t try. As a 777 pilot I, like many others, have wondered how the 777 would perform in the scenario where the pilots were incapacitated and the aircraft ran out of fuel. I had my ideas but there is nothing like seeing it for “real” so we tried this in a 777-2 full motion zero flight time approved simulator. We used a zero fuel weight of 175 tonnes. We let it run out of fuel at FL 250 in track hold and alt capture. However it would not make any difference what mode it was in as everything would drop out. 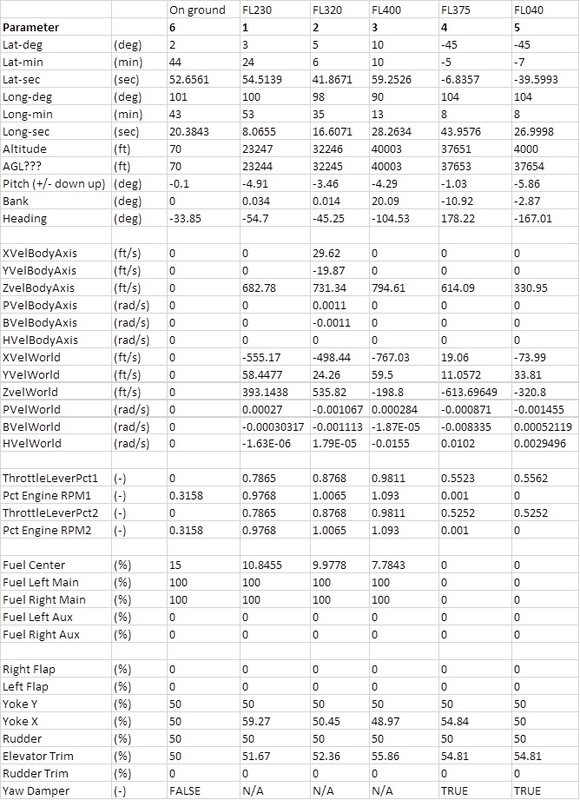 In real life one engine uses fractionally more fuel per hour than the other and there is typically a difference between main tanks of a few hundred kilos, so we had a 300 kg difference between the contents of the left and right tank. When the first engine failed TAC (Thrust asymmetry compensation) automatically applied rudder. The speed reduced from 320 knots indicated to 245 knots indicated. It was able to maintain 245 knots and FL250. When the second engine failed the rudder trim applied by TAC was taken out and the trim went to zero. The autopilot dropped out and the flight controls reverted to direct mode. The speed initially came back to 230 knots but then the nose started to lower. The nose continued to lower and the rate of descent increased to 4,000 feet per minute, the nose kept lowering and the descent rate increased to 7,500 feet per minute with a bank angle that increased to 25 degrees. The speed at this point had increased to 340 knots indicated, above VMO but there was no horn as it was on limited electrics. About this point the RAT (Ram air turbine) chipped in and the CDUs and copilot’s PFD (Primary flight display) came alive. The flight controls stayed in direct mode.The eicas screen was full of messages like pitot heat, flight controls, APU fault (The APU had tried to autostart due double engine failure but failed due no fuel to start it) low fuel pressure etc. Then with a max descent rate of almost 8,000 feet per minute the nose started to slowly rise and keep rising. We had dropped to about FL170 but the nose slowly rose up to 6 degrees pitch up and we started climbing at about 3000 feet per minute and the bank angle reduced to only 5 degrees. It climbed back up to FL210 at which point the speed had come back to 220 knots and then the nose dropped down again and we were soon back to descending at 8000 feet per minute. So basically a series of phugoid oscillations with bank angle between 5 and 25 degrees and pitch attitude between about 9 degrees nose down and 5 degrees pitch up. It was losing about 8000 feet and then gaining about 3 or 4000 feet with airspeed fluctuating between 220 and 340 knots. We didn’t watch it all the way down due time constraints and stopped the experiment at 10,000 feet but it was consistent all the way down. Having watched it I can say with certainty that if the pilots were incapacitated and it ran out of fuel there is no way it could have landed on the water with anything like a survivable impact. Just passing on the info. “@Gysbreght. If it’s not there it is somewhere else. Why? Many people from various backgrounds have used the ISAT to form hypothetical flight paths. The ISAT data has also been used on known flight paths (by the SSWG and the DTSG) for a large ensemble of flights. My sense is that the physics and the interpretation of the ISAT data is very well understood. Of course, there remains the remote possibility that the MH370 ISAT data has been tampered with. Short of that, there is absolutely no reason to believe we don’t have the correct understanding of what the data is able to tell us. If I may, hope I am not in that maniacal paranoia zone 😀 but I am inclined to believe that the simulator was not broken based on the evidence shown. I think Z deliberately or otherwise put it out as broken for some reason or other. The only reason I could think of is probably to give everyone the impression post-event that he had not been using it.and so no inquiry would be made into it though complete trashing of it would worked infinitesimally better. Probably he thought that would have been pointless for some unknown reason. Still to model all that 33 days before the actual event is a bit perplexing, a big time gap in my opinion. The time gap does not raise suspicions for me. I am of the opinion that a flight to Europe would have served Z’s purpose (whatever that was) better than a flight to Beijing. I don’t know how much, if any, control pilots have over crew scheduling assignments. I think the flight chosen had more to do with the timing of the purpose, and it was simply sub-optimal but workable. I think the recovered SIO routes on Zaharie’s FS add very little weight to his possible guilt. So I think it’s reprehensible that this is treated as a smoking gun, as much of the media coverage does. However, telling people that it was broken is the sort of excuse one might see by a person hiding depression if a family member asked why he was suddenly not spending time on it, or if a friend asked if they might come over and “co-pilot” on it. Again, with reference to his FS, all we really know is that there were some odd SIO waypoints that apparently date to this period. The rest is speculation based on hearsay [that he in fact was telling people this] or true-but-misinterpreted [the FS may have been down, or suffering glitches, that is working-but-not-really-playable]! Wow. I am always baffled by how different people can look at the same information and draw vastly different conclusions. To me, the simulator data clinches what I suspected all along, and to you it is relatively meaningless. Confirmation bias illustrated. On August 10, 2016 at 1:20 AM @buyerninety posted a link to the Microsoft ESP/SDK webpage. I also obtained the document in the second link, but that was rather disappointing. It is entry-level and does not discuss the parameters in question. As far as why I trust the ISAT data, as a layman I have to assume the international experts/Boeing experts/intelligence community/etc. all seem to accept that interpretation. Its seems many people never watch outside the window when flying . The 777 Flaperon is a wonder , like a ships stabilizer it is working 24-7 to keep the craft smoothly flying in turbulent air . It must be the hardest working part of the air frame. Surely it is not beyond the wit of the engineers to determine the cause of damage seen in the recovered part ? What is the problem ? @DennisW – I agree. If Z headed directly towards Nicobar on a trip destined for Beijing, all sorts of ATC and military Radar would have noticed. He picked the perfect point for the diversion. What’s the problem.. Zoom in on the aileron of the A320 Hudson ditch. You do have a point but the giveaway is “hiding a depression”………..depressive enough to be suicidal? Family says there were no signs though in one interview a NOK does say of a withdrawn person…broken sim being part of that withdrawal?? a. why didnt he do it if the reason was personal turmoil or depression. If it is (b), no prizes for guessing what was that. 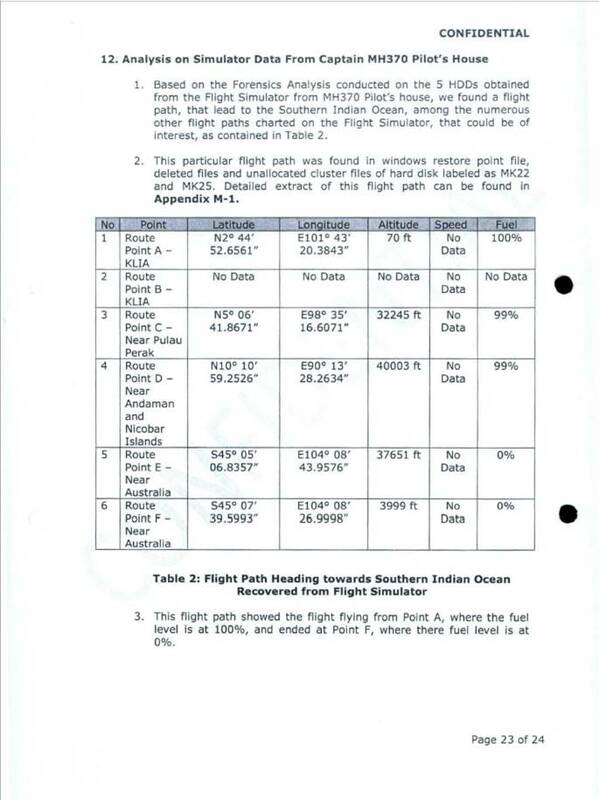 Alternatively if it was still (a), why risk a cross-peninsular flight, MT radar tracking, possible shootdown etc to get from IGARI to FMT and beyond when he could have leveraged on the Euro or Indian, he was assigned to fly if he had been from Feb 3 to March 8. Its all the above and the fact that the only evidence that indicates that it was a manned flight till the end is a “hydrodynamically” (one postulation, remember) damaged flap that prevents me from wholly accepting suicide-mass murder by default manned flight as the cause. Not that I have totally rejected that out of hand. Alternatively, a lithium fire or a fuselage perforation + antennae damage leading to hypoxia at FMT plus a ghost flight thenceforth and dive/high impact terminus is highly persuasive cos it fits the ISAT data and is proven possible by past incidents involving Boeing which I have linked. In fact, I just looked at JAL 123 and noticed that photos of it does show large debris pieces despite it being a high speed dive too albeit on land. And one additional thing that crossed my mind, I did mention Fugro being ill equipped. What if Fugro is playing good cop/bad cop i.e, putting it out that ATSB are searching in the wrong area just to extend the search elsewhere and wangle a contract extension in bargain and get, we know what, in return…I mean its all very plausible….opportunities galore for whoever wants to make hay. And after rethinking the manned flight + suicide theory as inadequate (as at that point we didnt have the flaperon etc, i took a different tack when I came in here peddling the SCS shootdown cos I had a photo of debris (a wing portion) from a Vietnamese news site plus the reported Kiwi and Malaysian eyewitness accounts plus KAL 1983 flight report to go by. And those who care to read my comments will note that I bring stuff that undercuts my previous stance simply because I am constantly nitpicking and unpicking my thoughts as new evidence emerges simply I don’t want to finger anyone or any cause based on an evolving situation. Just to say that,at the moment at least, the official version is the most cogent though not final irrefutable version it purports to be. “The world-wide deep-water industry is simply wondering how the contract could have been awarded the way that it has been,” Michael Williamson, president of Seattle-based sonar firm Williamson & Associates, wrote in a Sept. 15 letter to the Australian government that was reviewed by The Wall Street Journal. Fugro is ill-equipped and is likely to fail, the letter claimed. Williamson bid for the Flight 370 contract as part of a consortium involving Oceaneering International and salvage firm Svitzer, a subsidiary of A.P. Moller–Maersk Group. It could be sour grapes as someone in the link says. It shouldnt be I “got kicked out” but rather I got pissed off. And to me the flight-sim is the evident red herring. But it remains to see in exactly what respect. There are so many kinds of red herrings that it is hard to figure out how each and everyone works. I am not sure if this saga has ended up for me or not, but I certainly have more time now, and I can spend it for something more useful and enjoyable rather than commenting someone’s nonsense. Gysbreght is probably a good aeronautics engineer, but he has demonstrated certain gaps in mechanics and math. One of the major flaws I had in my published model was the absence of wind-induced torque. I think this is what Gysbreght (and RetiredF4) intuitively tried to formulate, but failed. The rest came from Gysbreght’s misunderstanding of certain things. But the major interesting issue I tried to attract attention to, is the likely existence of a stable AFDS-controlled roll mode ATT (attitude hold). This is the key point. To my surprise Jeff Wise was not only reluctant to discuss it, but clearly demonstrated his unwillingness and impatience. Why? Is it because it does not fit his narrative? For now I prefer spending time for something more valuable than pointless arguing. If we only had public context reference as to these sim data mean. Ie if Shah kept a planning log or something to describe each time he installed and uninstalled the full mFSX environment. Without all we have is speculation. Sometimes we spend too much time sensitized to red herring possibilities. My general approach follows the old school adage – if it quacks like duck and walks like a duck, it probably is a duck. Agreed ! In fact it looks worse than the 777 flaperon. So therefore can we not make an educated estimate of the speed of MH370 on contact with the water? Naturally I see your point, Dennis. You have as far as I can see probably adopted a healthy relationship to the buzz. Still, I notice above that you on the one hand are convinced that the Kingdom of Malasyia is covering up something, at least the guilt of one of its subjects, and furthermore are holding the Commonwealth’s southeastern branch office of the Queen’s Department of Infastructure in a very short leash. But you are at the same time accepting without a whisper of doubt the same authority’s (from where I am standing) alleged fishing of binary debris from the possibly endless and unforgiven ocean that is Shah’s harddrive(s). What made them so reliable all of a sudden? To me that has the clear ring of those black boxes that ships competed in hearing in SIO, despite the fact that MAS seems to have forgotten to switch batteries (and Boeing and everyone else by the way believes that a self-erasing VDR and nonresponsive FTL (or what it is called) is how the mill should be run. And that you should be able to cut off all communication whatsoever and kill 238 passengers with the push of some two buttons. and Berlin. And Moscow. And Manhattan. And any little island with a military landing strip in the Pacific and the Indian Ocean. The idea with the red herring is that you are not supposed to understand what you are missing or that you are missing something because there is something quite similar there in the l-o-s. Why should MAS try to divert suspiscion from Shah? At the cost of themselves? Really? I am also perplexed by the number of recent press releases from both the Aussies and the Malays that go far out of their way to assert that the simulator data should not be used to direct suspicion toward Shah. A classic example of “the lady doth protest to much, methinks”. I put it in the same category as a judge instructing a jury to disregard what they just heard or saw. Both make absolutely no pragmatic sense. So far as we know there were only two people on board MH370 who could possibly fly the aircraft. One of them had a flight path on his simulator, created some 30 days prior to the aircraft diversion, making a turn toward the SIO at approximately the place where previous analytics have suggested it occurred. We are then told by the search authorities that we should attach no significance to that. As if the logical route from KL to the South pole was to first go West over the Malay Peninsula, and then initiate the path South. What this all leads me to believe is that I am among the last of the sane people on the planet. ATSB are playing silly buggers! Again. @Wazir Roslan. The below I hope is the re-posting you sought. You may have it in mind that Jeremy’s friend’s simulator account is of a Boeing run but not so far as I know. About, your “Wish the NTSB + ICAO had been in charge of this from Day 1”, finding this wreckage might have been as difficult for them. I think the overall effort has been remarkable, making the most of paltry and extraneous data and giving at least a shot at finding the aircraft, having got off to a poor start. Like searches have been more bounded. Vaguely related to your point, HMAS Sydney, cruiser, was sunk off the WA coast in 1941, found in 2008. The US still searches for the USS Indianapolis, sunk in 1945. These vessels were 60 times plus the mass of MH370. Article need not have been so late. ‘Spotted’ here first folks. Re Retraction by ATSB. Its behind a paywall. One theory is that Captain Zaharie Ahmad Shah hijacked his own aircraft. ATSB chief commissioner Greg Hood went on the offensive this week in an interview with The Australian to try to discredit the theory that Captain Zaharie Ahmad Shah hijacked his own aircraft and glided it outside the current search area. 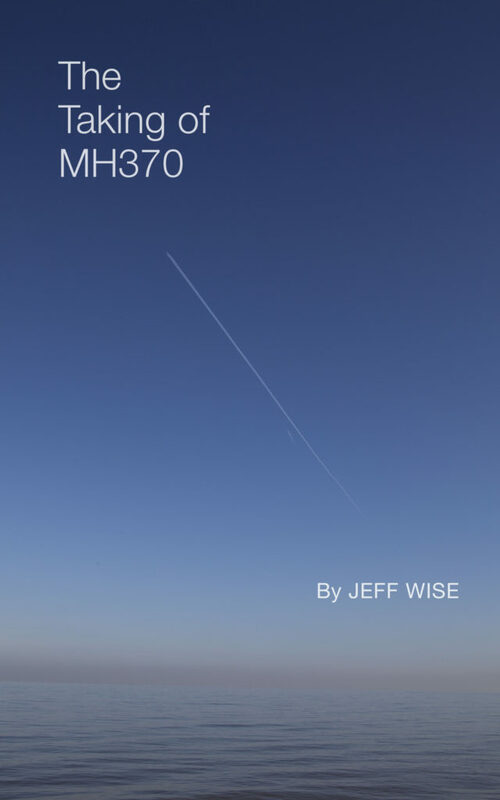 Mr Hood insisted analysis of Inmarsat satellite tracking data by Defence scientists had ­concluded that MH370 rapidly descended in an unpiloted crash. 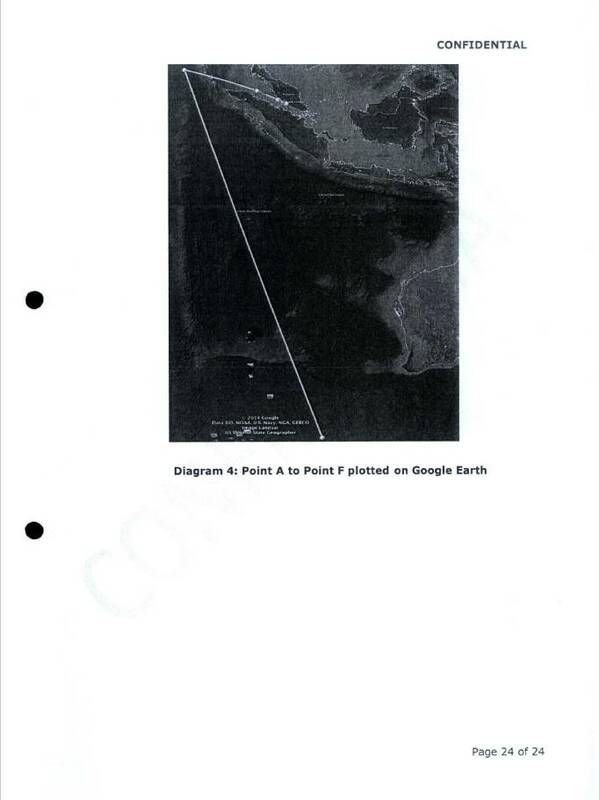 The ATSB has previously claimed it had “consensus” for that view within the Search Strategy Working Group, made up of experts from Inmarsat, Boeing, the US Nat­ional Transportation Safety Board, aerospace group Thales, the British Air Accidents Investigation Branch, the Malaysian Department of Civil Aviation and the Australian Defence Science and Technology Organisation. It has abandoned that claim, without acknowledging it has done so or explaining why. Aerospace engineer Richard Godfrey, a member of the independent group of MH370 expert observers, spotted the deletion of the “consensus” claim through a computer change tracker, and revealed it to The Australian. On July 27, in its regular weekly bulletin, the Joint Agency Co-ordination Centre, established by the ­federal government to direct the search for MH370, promoted the ATSB’s theory that the aircraft went down ­suddenly. 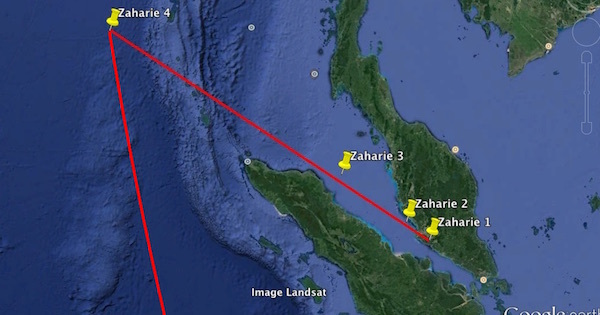 It downplayed FBI findings that Zaharie had run a simulated flight to the Indian Ocean on his home computer that closely matched the zigzag route the Boeing 777 took. MH370 went missing on March 8, 2014, on a scheduled flight from Kuala Lumpur to Beijing. Mr Godfrey said the most likely explanation for the “consensus’’ removal is that one of the experts on the strategy group complained that they did not support such a conclusion. JACC director Annette Clark, ATSB spokesman Daniel O’Malley and Transport Minister Darren Chester’s office ­refused to answer questions about MH370, while the ATSB spokesman who issued the July 27 bulletin, Tim Dawson, hung up when asked to explain the ­deletion. Mr Hood did not respond to a request for interview. I think at least the photo of that ‘Hudson’ aileron shows no high speed impact or flutter is needed to cause the kind of damage we see on the flaperon and the outboard flap section. It’s similar trailing edge damage. This damage (Hudson-ditch) is caused by low speed impact with the water. To make the comparison even stronger I drop another photo of the Hudson-A320. You can see the first outboard flap section has broken away quite the same as the Pemba-piece. I cann’t help but to suspect they did some interesting observations on the Pemba-piece that made them change there minds.